Narrative: At 3:55 PM Firefighters from stations 2,7,8,9,12,16,17 and CP 6-3 responded to a reported commercial structure fire. The first arriving engine company found heavy flames and smoke showing from the roof of the one-story tavern business. 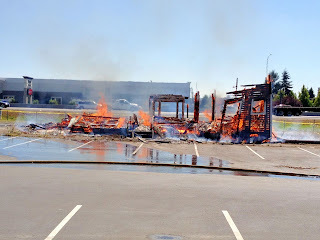 Initially crews mounted an interior attack, but moved to a defensive strategy as the well-entrenched fire compromised the structural stability of the building. A single employee was in the business at the time of the fire, and was able to escape without harm. The cause of the fire was determined to be embers from a weed burning propane torch operation ignited the fire. The fire was concealed inside the exterior wall of the building until it eventually burned its way up to the roof of the structure. The fire resulted in estimated $130,000 damage to the building and its contents, and is considered a total loss. On Tuesday August 20, 2013 Tacoma Fire department conducted a live fire training burn of a house located at 1623 62nd Avenue East in Fife. Live fire training in a controlled environment is valuable tool to develop firefighting skills. Nearly 30 firefighters and staff participated in a variety of drills throughout the day. Training objectives included interior fire attack, hose handling, and using a thermal imaging camera to search for and observe fire behavior. TFD’s training center staff coordinated the regulatory aspects of the burn and there were no injuries to report.